when it showered its citizens with benefits it felt like bountiful rain and when it taxed its citizens it was imperceptible like the evaporation of moisture. Our government’s tax and benefits system is decidedly not so. What self-respecting civilization would design a tax code that is 75,000 pages and costs the country $431 billion annually to administer? Our tax code is complex, unfair, damaging to our economy, and its thousands of pages of code are completely beyond understanding by all but a few highly specialized lawyers and accountants! There is a simple answer – one so simple that I don’t think we’ll ever adopt it. Unfortunately there’s too much vested interest in the status quo. But let’s dream for a moment and see what this proposed solution could do for us. The tax code consists of less than a dozen pages. You never have to file a return. You have to keep no records of your incomes, medical records, stock purchases and sales, interest payments and receipts. No records period. Tax cheating is virtually impossible, no need for costly enforcements and tax courts and rulings. There are no payroll taxes, individual or corporate. No gas depletion benefits, no depreciation and amortization, no taxes on foreign income, no inventory taxes, no LIFO, FIFO or fee-fi-fo-fum. And no social engineering of any kind using the tax code. It would minimize government interference in our lives while still providing revenue for government functions – a dream for conservatives who sleep with a copy of Ayn Rand under their pillows. Sounds awesome, so what is it? No. In fact, I was strongly opposed to the Bush tax cut that was enacted in 2003, and it’s one of the reasons I got fired. You know, between that and saying there was no evidence of weapons of mass destruction in Iraq, those were pretty significant causes to get fired, which I was happy to get fired for, because I was pretty convinced that the third tax cut didn’t make sense .. Okay, that was an aside, an obiter dictum to my main case, as it were. What kind of rate would we need to supplant all our tax collection? The amount that our Federal government needs to spend every year is estimated (at zero long term deficits) to be about 19% of GDP including all entitlements such as Social Security, Medicare, welfare, unemployment benefits etc. So a VAT of about 20% would do it. The second biggest advantage is the nonvolatility of revenues. With an income based tax system, as we have today, the tax revenues soar when GDP is up (disproportionately) and sink when there is a recession. So when our our GDP grows by say 3% the tax revenues rise by 15% and if the GDP falls by 3% revenues tank by 15 -30%! In boom times the government gets a bonanza and builds in spending programs beyond their means. 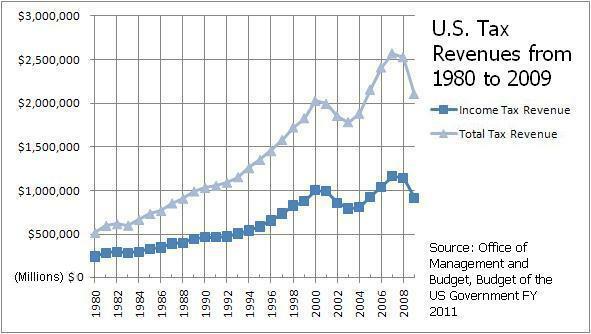 In bust times the revenues dry up and huge deficits are racked up. See my blog about boom and bust cycles. With VAT the tax revenues rise and fall roughly in line with GDP so they are much more stable and predictable allowing much better allocations. A third major advantage is the ease with which a sales tax can be implemented and the high degree of compliance. An oft stated disadvantage of VAT is that it is considered non progressive. It is said that the poor spend more of their income buying things than the rich who have the luxury of saving. So someone earning, say, $25,000 a year, who would spend most of their income, would pay sales tax on all their income. In contrast someone earning $1,000,000 may spend only a fraction of their income, investing or saving the rest, and therefore will pay taxes on a smaller portion of income. 1. No VAT on food items. Since the less prosperous spend more of their income proportionately on food and rent, they would pay taxes on a much smaller percentage of earnings. 2. We can devise a system where the poor can file for a tax credit to further ease the VAT burden on them. A tax credit for the very poor based on income – for those earning $25,000 per year, say. This way only a small number of people eligible for a tax credit would need to file (and it wouldn’t be mandatory). Remember that our other welfare programs would still be in effect to help the poor. As for the very rich not consuming but saving. That doesn’t really effect progressivity. When they save they are producing productive assets for society increasing buying power and taxes. Ultimately they will spend their savings or give them to others to spend. Zero sum effect in the long run! A bigger perceived negative is that it gives the government easy money and that they will institute income taxes anyway in addition to the VAT. Perhaps it is this fear that keeps VAT from being implemented. I don’t think so. I think we don’t implement it because the wealthy and powerful know that they cannot dodge taxes with a VAT. They cannot game the system as they do with the current dizzyingly complex tax code. And in America money still outshouts common sense.